Aaron Sorrels “The Unemployed Alcoholic” approaches comedy, speaking and recovery support in a nonthreatening way.He shares stories and lessons he’s learned while respecting other peoples’ boundaries and decisions. After years of struggling with alcohol and the results of its impact, he got clean, got focused and got funny. Aaron uses humor to facilitate the steps of recovery. He takes the stage with a purpose to bring the laughs and work through the struggles associated with addiction and recovery. He’s developed the REAL Support model and will not judge, criticize or attempt to control people. Click here to read more about REAL Support. 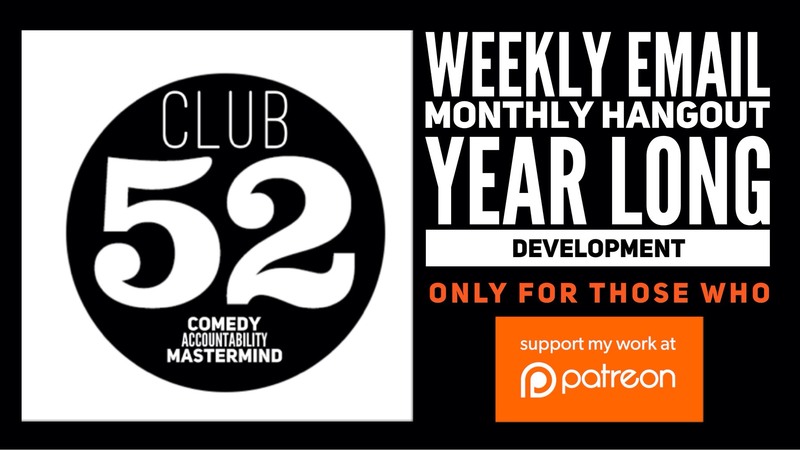 In fact so much more, that is you are a Patreon Club 52 member – there is a bonus podcast waiting for you! Just head on over to PATREON right now to listen. This episode is brought to you by Patreon supporter ALLEN-MICHAEL HARBER and CLUB 52. Club 52 is a one-year program designed to challenge you to get bigger, better and more bookable. You will be prompted to examine your material, performance and business practices via email each week. You will define your stage persona, style and point of view. You will learn how to create expectations through your marketing, branding and introductions. From nailing your elevator pitch, to refining your value proposition, you will learn how to make it easier for bookers to hire you. Meet comics from around the country during a quarterly online “hangout”. As a group, we tackle our top struggles and how to approach overcoming them. Think of it as your personal monthly mastermind group. Over the course of the year you will learn how to get more gigs, and leverage every opportunity that comes your way.